Why smash the notice board up? Complete bloody idiots with too much time on their hands man! I don't know if you're joking (or making a sly dig at the person) but I saw who did it. It was done in the middle of the day and he wasn't being very subtle about it. It was one guy, late 20's - early 30's (in case anyone is ready to blame the younger residents). I assumed he was one of the same group of people who put that new one up and all those benches and planted the trees. Ahhhh Mate!! I've just seen the mashed up board in the bin area! Maybe Lucy was right, why vandalise it and then drop it right in front of our door? Maybe someones trying to make a point? Whats the point anyway? 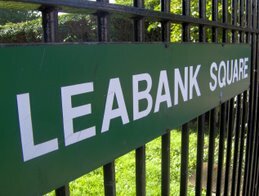 they don't like kids doing art in leabank? They dont like our block? They just angry sods? If it is the same bunch of artists why did they destroy our kids art? Surely they could just have taken it down, not mangled the picture? And on whos orders did they do this? Does no one consult us any more? Sóna maybe it was the guys you knicked the 'for sale' signs off of in the first place. Came back for a bit of revenge. It doesn't excuse the vandalism, but think of it as an opportunity for another bout of imagination and inspiration. Well whoever they are, Hackney Council want to charge us £70 to remove the flytipping. Even if was the pmms lot, what made them think its okay to just dump them? I tried to ask if they would just take it in the dumptruck, and they refused (geddit?!) but now someone has gone and put it into the actual bin, so we'll see if they take it out again next week. It's such a pity that someone trashed it, all my sign-fors love driving up to the map and seeing which block I live in straight away. Now they join the rest circling the carpark. I think its just mean that they not only smashed it up, but also then came and dumped it so that the kids who did it can see the destruction. What kind of sick people would do that to kids? Too much change around here man! Everyday some new ting! Who aksed me if I wnat noticeboard or gate? dunno matt. smells more like 'er madge & 2 corgies in the terraces to me. who crowned 'er anyway. The lucy sessions? I used to fancy you so badly! I personally think the green area is looking a lot better at least someone is making an effort to improve the Square.. and can you imagine what the Square would be like without a gate next year during the Olympics? What is sad about both notice boards is the fact that when people do put stuff on them some idiot has to take it down again, get a life for god's sake! Just seen the pic of you after u painted amy's face lucy, way back when...and your still as gorgeous as ever lucy! "L"
Okay, well you're obviously taking the p*** because I look a state in that picture. Who are you? You definitely don't look a state. Far from it...Your gorgeous Lucy and you always have been..
Lmao! No im not your mum.. Although hope shes well.. I'll leave it as im a secret admirer..